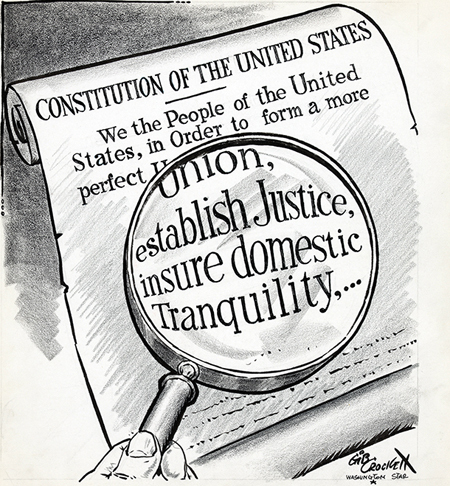 Students deepen their understanding of the preamble to the U.S. Constitution with this primary source image sequencing activity. Direct students to work individually, in pairs or in small groups to write a definition of the word “democracy”. When students have finished, tell them that the word “democracy” comes from two Greek words: “demos” meaning “people” and “kratos” meaning “power” or “authority.” Ask them if they now want to revise the definitions they wrote. Review student definitions and then explain that they will be looking at how our democracy was defined in the preamble of the U.S. Constitution. Display the preamble to the Constitution and read it aloud (you or a student). Divide students into groups and ask groups to define the following phrases in their own words as best they can (you may choose to have them work with or without the assistance of a dictionary), writing down each phrase on one side of a strip of paper, notecard, or sticky note and the translation on the other side. When students have finished, read the preamble aloud again. When you come to each underlined phrase, have a representative from each group stand and hold up the image they chose to accompany that phrase. Discuss students’ reasoning for pairing images and phrases. In the end, you may want to clarify any vocabulary as well as show students the images with the text included (see Library URLs). Discuss with students the rules of the class and the rights and responsibilities you have as the teacher and they have as students. Direct student groups to create a class preamble that would describe the purpose of the class set up. Share each group’s class preamble and use these to create a unified class preamble. Display the class preamble prominently in the classroom.